Pakistan’s trade deficit shrank to $6.2 billion in first two months of the current fiscal year as the pace of growth in exports beat the increase in imports, indicating government’s administrative measures have started yielding results. 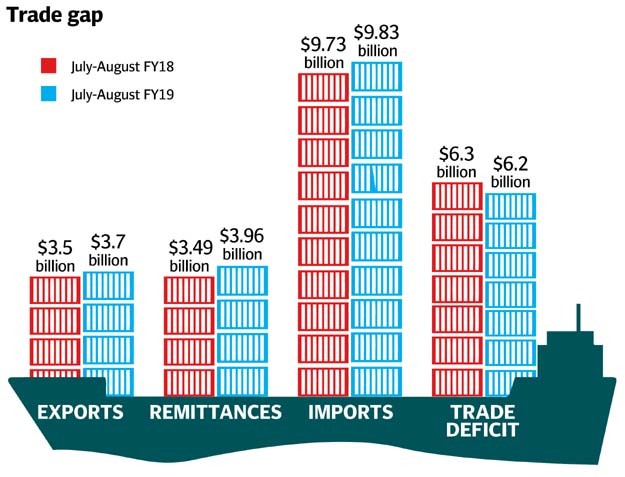 The trade deficit for July-August was 1.3% lower than the deficit recorded in the same period of previous fiscal year, reported the Pakistan Bureau of Statistics (PBS) on Tuesday. The deficit was $78 million less than the same period of previous year. Exports in July-August FY19 increased 5.1% to $3.7 billion. In absolute terms, export receipts were $176 million higher than the same period of previous year. Remittances also posted a healthy growth which will ease pressure on the country’s balance of payments. Cumulatively, in the first two months, overseas Pakistanis remitted $3.96 billion, a growth of 13.45% compared with $3.49 billion in the same period of the preceding year. Imports were valued at $9.83 billion, which was only 1% or $98 million higher than the import bill in the corresponding period of previous fiscal year. Since December 2017, the State Bank of Pakistan has let the rupee depreciate against the US dollar by around 14.9% to Rs123.93 to a dollar. The central bank also expanded the list of non-essential goods to 535 for which 100% Letter of Credit (LC) margin is required. It has also placed restrictions on advance payments and imports funded from open accounts. All these measures were taken to contain the import bill. There are also new restrictions on bulk movement of foreign currency within Pakistan aimed at keeping the flow of dollars under check. The new Pakistan Tehreek-e-Insaf (PTI) government is also in the process of finalising measures that it intends to take to increase exports and contain the ballooning import bill. Sources said the government expected new measures to result in over 18% increase in exports to $29.4 billion in the current fiscal year. The federal government is also planning to let the rupee weaken by another 9%, enhance the additional customs duty rate and increase regulatory duty to cut the import bill to $58 billion. Success of these measures could restrict the current account deficit to below $14 billion in the current fiscal year, which otherwise is expected to widen to $18.5 billion, according to sources. A higher-than-projected current account deficit will have a direct bearing on the country’s foreign currency reserves, which are again on the decline, standing at only $9.9 billion at the end of August 2018. Pakistan will require about $31 billion in the current fiscal year to meet its external financing requirements, including debt repayment obligations of $11.1 billion. The PBS data showed that Pakistan’s exports grew 8.4% to $2.1 billion in August over the same month of previous year. In absolute terms, export receipts were higher by $157 million. Imports grew at a far lower pace of 1.4% and stood at $5 billion in August. The import bill was only $69 million more than that in August 2017. Consequently, the trade deficit contracted 2.9% to nearly $3 billion in August over the same month of previous year. In absolute terms, the deficit was lower by $88 million. On a month-on-month basis, exports in August increased 22.5% to $2.1 billion over July. These were $371 million higher than the receipts in the preceding month. Imports grew only 3.2% over July to $5 billion. Month-on-month trade deficit shrank 6.8% in August over July.